In honor of Midsummer's Eve (a popular celebration to observe the summer solstice) which is being held in many parts of the world this weekend, I wanted to share one of my favorite paintings with you. 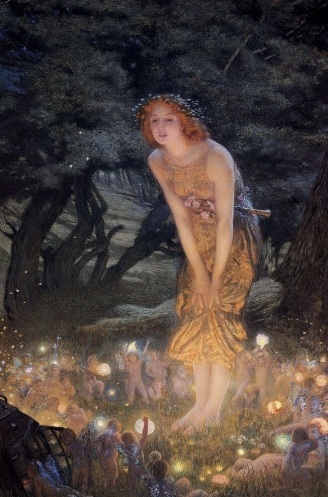 Midsummer Eve was created in 1908 by the English artist Edward Robert Hughes. I love the feeling I get when I look at this image. It's breathtaking. I adore the redheaded fairy (yes, I am biased) and all of the magical creatures holding their lambent orbs. I had this painting framed in my apartment when I was in college and look forward to displaying it again when I eventually find a new place. It's an enchanting depiction and one of my favorites! Solstice celebrations still center around the day of the astronomical summer solstice. Some choose to hold the rite on the 21st of June, even when this is not the longest day of the year, and some celebrate June 24, the day of the solstice in Roman times. Although Midsummer is originally a pagan holiday, in Christianity it is associated with the nativity of John the Baptist, which is observed on the same day, June 24, in the Catholic, Orthodox and some Protestant churches. The celebration of Midsummer's Eve was from ancient times linked to the summer solstice. Some people believed that mid-summer plants, especially Calendula, had miraculous healing powers and they therefore picked them on this night. Bonfires were lit to protect against evil spirits which were believed to roam freely when the sun was turning southwards again. In later years, witches were also thought to be on their way to meetings with other powerful beings.